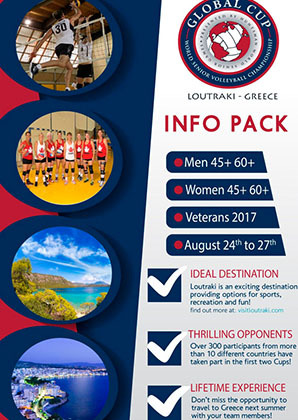 Entry into the Global Cup - a world championship tournament - is by invitation only, allowing the best Women’s and Men’s 45+ & 60+ teams in the world to compete for the title of “World Senior Volleyball Champion”. Only one team per country will be accepted. A maximum of sixteen (16) teams per gender will be accepted into this Championship. Teams are allowed a maximum of 15 rostered players. Additional substitutes are not allowed. Teams are accepted on a first-come-first served basis.